In the early part of the 19th Century feeling between radicals and conservatives was very bitter. This was as true of the literary world as in politics, and writers at all levels being divided. In the Radical camp were amongst others William Godwin and his daughter Mary; Shelley, Keats and their friends; The Hunt brothers Leigh and John; Hazlitt, and many others. Hunt had taken his radical principles to the extent of being imprisoned for his articles attacking the Prince Regent. 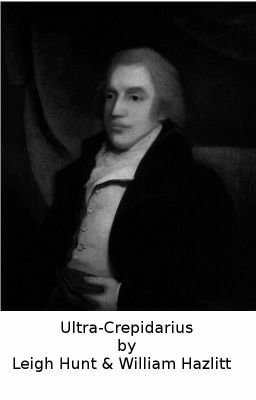 Prominent among the Conservative faction was William Gifford, editor of the hugely influential Quarterly Review. Gifford combined a venemouis pen with a contempt for both the ideals and the literary merit of the Radicals. In 1818 he published an attack by John Wilson Croker on Keats' Endymion which was deeply resented by Leigh Hunt and William Hazlitt, and they co-operated to produce this attack in revenge.